Let the party begin. The Beijing Olympics are just a year away. Sprawling Tiananmen Square was the center of celebrations for thousands of ordinary Chinese and hundreds of Olympic officials as countdown clocks across Beijing reach the one-year mark. The magic moment came at 8:08 p.m.and 8 seconds,marking one year until next year's opening ceremony on August 8, 2008. 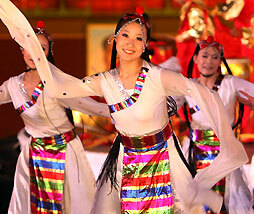 The host city of Beijing invited the world to the 2008 Beijing Olympics with a dazzling song-and-dance and fireworks display. Eight is a lucky number in China, and everything seems on schedule for Beijing to host the most awaited and most expensive Olympics in history. 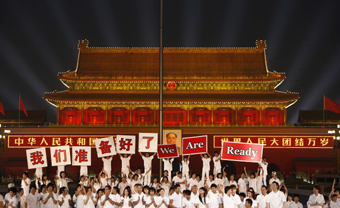 Beijing's new anthem, the just-released pop song "We're Ready", was part of a two-hour ceremony played out on a stage built under banks of searchlights. "From what we have seen so far, the preparations for Beijing 2008 are truly impressive in every regard," said International Olympic Committee President Jacques Rogge, who is in Beijing this week meeting students, planting trees and greeting Olympic sponsors. "I don't think we have ever seen preparations on this scale." "The Olympic Games are the celebration of the values of Olympics and of sporting ideals by the youth of the world. They engender dreams and inspiration in the hearts of young people everywhere. I therefore call upon you all to enjoy the Games one year from now," said Rogge. 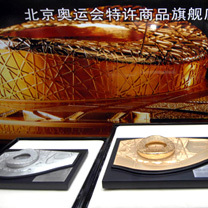 It is the first time the traditional IOC ceremoney has been held in the host city of the Games rather than the IOC headquarters in Lausanne , Switzerland. China has been efficient in building venues. Except for the "Bird's Nest" National Stadium, all of the 37 venues are to be finished by the end of this year. Venue construction has eaten up only a part of the US$40 billion being spent on new subway lines and skyscrapers to remake the capital. There have been few delays, and the US$2.1 billion operating budget has been offset by the vast revenue expected from TV and sponsorship. To guarantee clean air during the 17-day Olympics, about 1 million of the city's 3.3 million vehicles are expected to be kept off the roads. Officials are also hoping to control the weather. Meteorologists began tests last month, firing rockets to disperse rain clouds,a move to guarantee sunshine. They've also fired rockets to induce rain to clean the air. Old habits like spitting, jumping ahead in line and littering are under siege in campaigns to improve behavior. 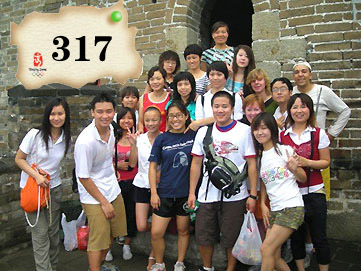 From taxi drivers to 560,000 volunteers, everyone is to learn some English. Chinese officials are also reminding citizens of being good sports. "It is natural for the Chinese people to hope and wish for good performances since China is the host country," said Wang Wei, an executive vice president of the Beijing organizing committee. "I also want to tell the Chinese spectators that while we can be a winner, we should also be a polite loser." Revenue from local sponsorship is expected to be at least double that of Sydney or Athens with billions more spent on advertising and promotion. Although many athletes will eat specialized diets provided by their own teams, Olympic organizers have also promised to track food electronically from the field to the consumer. More than a million Beijingers made their way to the city's parks as sunshine broke through the smog for the first time this week. "We're very excited, very happy to have the Olympic Games in China," said one women pensioner, wiping make-up from her face after taking part in a display of traditional folk dancing in a Beijing park. 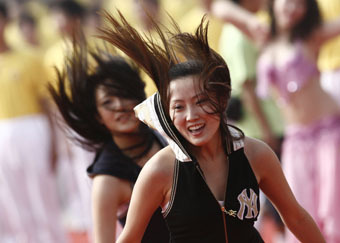 Another women, catching her breath after a display of aerobics, said: "This is a dream that has lasted for a century." 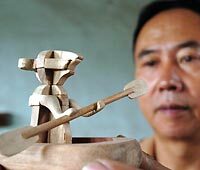 "We want foreigners to discover Chinese culture and get a taste of our ancient civilization."